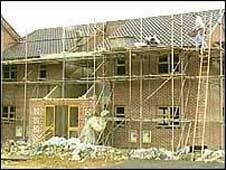 Plans for nearly 50,000 new homes in "eco-towns" in the east of England have been rejected as "unacceptable". The East of England Regional Assembly (EERA) said plans in Norfolk, Essex, Cambridgeshire and Bedfordshire are not linked to jobs or public transport. "They would become dormitory towns with unacceptable levels of car commuting", EERA said in its response to plans set out for public consultation. Councillors were also concerned that planning processes were being bypassed. EERA had already planned for two new settlements at Northstowe in Cambridgeshire and Wixams in Bedfordshire as part of the East of England Plan outlining development up to 2021. Derrick Ashley, chairman of the assembly's planning panel said: "Government should halt this dash for eco-towns before more money and effort is wasted. "The public want high environmental standards for all new housing not speculative development in unsuitable locations. "Proposals for new settlements in the region should be decided through the assembly by local councils and other stakeholders to ensure sustainable growth in appropriate locations." The Assembly believes that the eco-town decision-making process should be transferred to its review of the East of England Plan which will identify the region's housing needs up to 2031. New towns are planned for Hanley Grange in Cambridgeshire, the former site of RAF Coltishall in Norfolk, Marston Vale near Bedford and Elsenham Village in Essex.